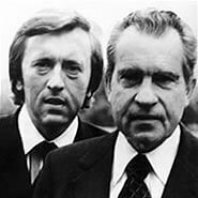 I first posted this article back in October 2011 and republish it today in memory and as a tribute to the man who inspired it, Sir David Frost who has sadly passed away. For those of you that are unfamiliar with the story of Frost vs Nixon then I would suggest you look it up as it is a great example of firstly journalism at its very best, but also provides a clear example of how you change the dynamic in an interview. A word of caution before reading on, this is only my experience, and I would only use this method in a situation that “felt right”. I know that is a subjective statement, but we all know, there is a time and place for everything. The tutorial was actually based on sales, and how to influence the outcome by taking the initiative, but I have used this technique in the past to change the feel of an interview, get to the core of what is required, and lay the foundation for a win. It can work for interviewers and interviewees. You must remember to move quickly, decisively and be professional. If you struggle with conversation do not read any further. Seriously. Let the interviewer begin. They will usually start with “thanks for coming”, “how are you” etc, etc. You could let them start the process of asking questions just to place them in their comfort zone. Then, at the opportune moment ask if it is possible to pause for a moment so that you can chat about, whether you get along (crucially appropriate if the person is going to be your manager or director), why they joined the company, and why you should and should not join the company. The last part is critical. If they turn beige or pink then this is probably not the person you want to be working for. If, as in most cases, they sit back in the chair and ask you to explain or carry on, a CONVERSATION will begin. The astute amongst you can now guide the conversation in whichever direction you choose but always look to finish, say thank you and ask to resume the interview. You now have completely lightened the room and the interview will seem natural and easy for both of you. People like people. Moreover, people like people that can offer a new approach or a different dynamic. And, using this technique will create a bond that could just be the deal clincher. Use the same approach but after the initial formality, put the pen and pad down and say that you would like to get to know the person and the interview structure as it stands does not allow for it (a white lie as this is the interview). Obviously, only employ the technique for candidates that have a chance of winning the role. ← Sir Alex Ferguson announces retirement: A Manager CV that will never be surpassed?